My favorite turkey is slow smoked with a simple salt and sugar brine. The natural flavor of the turkey comes through, complemented by the savory smoke flavor of applewood. The brine keeps even the white meat moist without masking the meat. First The Brine. I prefer to inject my meat with the brine especially for large items like a 20lb. turkey. Logistics come into play with this decision more than any gastronomic concerns. Its hard to find space in an overcrowded fridge that can fit a bucket big enough to hold a turkey. Pour the salt, MSG, brown sugar, sodium tripolyphosphate and apple juice into a pot and a bring to a boil. This should ensure that everything is completely dissolved into the apple juice. Once it has cooled add the milk. Don’t add the milk while everything is hot, it could curdle. Inject the brine through the entire turkey. Each injection should be less than 1/2 inch apart. Don’t worry there is no such thing as to much brine. Once injection is complete allow the turkey to sit in the fridge uncovered overnight. This will give the brine time to disperse within the turkey. Leaving the turkey uncovered will help the skin dry out making it crispy when smoked. Now its time to smoke. I like to use applewood for the turkey. It has a much lighter smoke flavor that won’t overwhelm the more delicate flavors of the white meat. Smoke the turkey for about 5 to 6 hours at 240F, or until the internal temperature reaches 140F. 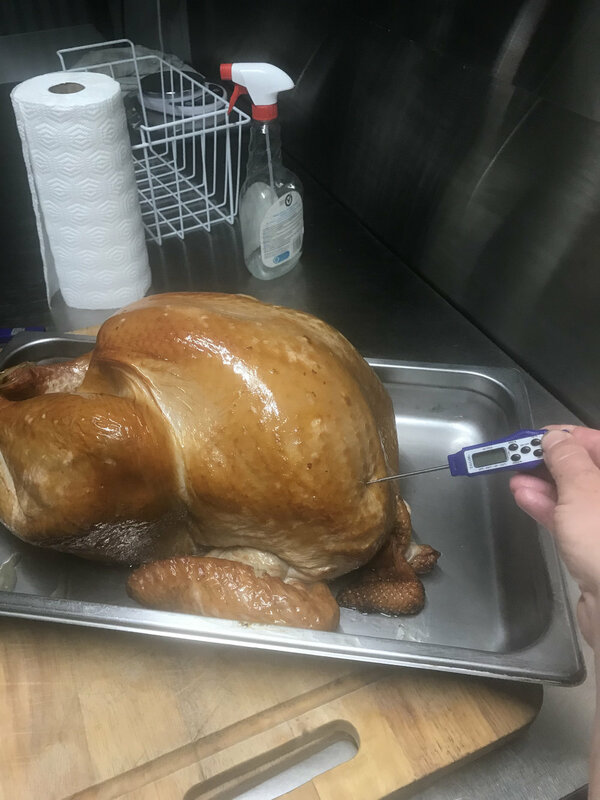 To take an accurate temperature of the meat test multiple points throughout the turkey. The thickest part of the breast and the joints of the drumsticks and thighs are particularly important. At the bottom of this blog is a series of images showing where to use the thermometer. Once you hit the magic number of 140 its time to crank up the heat and get that skin nice and crispy. Pour oil onto a paper towel and rub the skin down. You will notice a lot of ash coming off on the towel. Thats ok there is still plenty of smoke flavor within the meat. The black ash on the outside is mostly bitter. The oil is important this will be the difference between crispy skin and tough skin. Crank the smoker up to 350F or put the turkey in a preheated oven, again its already plenty smokey so an oven at this point won’t affect the flavor. Cook the turkey for one hour or until the internal temperature reaches 150F. Take the turkey out cover with foil and let it rest for one hour. Thats it your done! best turkey you have ever had guaranteed. Images of all the places to check the turkey’s temperature. Note the special attention paid around the joints. If even one of these spots is below the required temperature continue cooking even if another spot is above temperature.